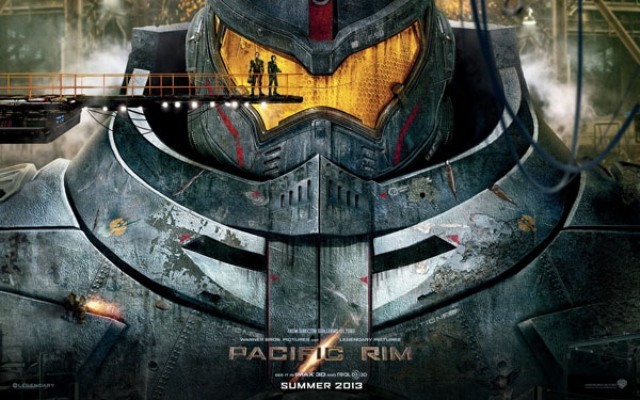 Pacific Rim: Big Godzilla-like Thrills for an even Bigger Screen! Since I was a kid I have been a fan of kaiju films. Every Saturday afternoon I would sit in front of the television set watching that week’s installment of the Creature Double Feature, as they showed such great films as Rodan, War Of The Gargantuas, Frankenstein Conquers The World and a whole variety of Godzilla and Gamera films. Yes they were cheesy but they were also a lot of fun and they are one of my fondest memories growing up. 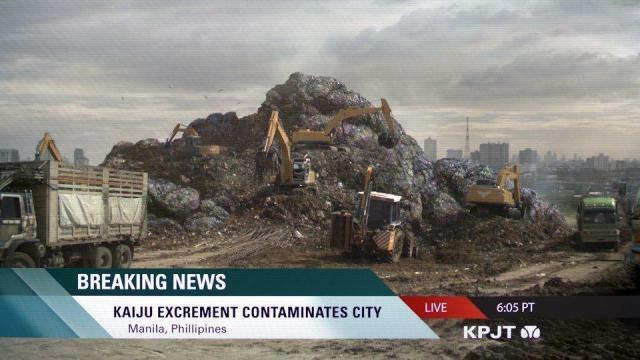 When word came out that Guillermo del Toro was making a kaiju film to be released during the summer of 2013, to be honest I was quite skeptical. Though I thoroughly enjoyed Cloverfield I still feel that the Roland Emmerich abortion, aka Godzilla, is one of the all time worst films ever made. As footage started to get released of this film, I still had my doubts, but felt the excitement of my inner child growing stronger. You saw very little of the kaiju and even less of the Jaegers, giant robots piloted by two people built to combat the giant monsters, coming through a portal at the Pacific rim. Would this be a Transformers rip-off or something special? Could it actually live up to the hype? I can now say without a doubt that this movie is something special and more than lives up to the hype. I decided that when I saw this film I would do it right; in 3-D and on an IMAX screen. I made the right choice. Even before the title of the film appears we are treated to an intense introduction as to what has been going on, with Jaegers fighting kaiju and plenty of destruction. You would think that you would get somewhat of a breather after the title appears but this is not the case. The action just does not stop and we are even treated to something rare in a monster movie, human character development. Yes, that’s right! You care about these people and you want them to succeed! This is a great formula and it works perfectly. I have stated before that I am not a fan of CGI effects though in some cases, when done right, it looks great. Robots tend to work great with this technology; living, breathing creatures not so much. I will say though it works here and the giant monsters are very convincing and if the action slows down enough, you can make out the fact that these monsters were designed to actually look like they could be done with men in rubber suits, just like the good old days of Toho and Toei. I will go as far as saying that the effects are pretty much flawless. I do have a complaint though, not about the effects themselves but with how they were shot and edited. Many of the battles scenes are shot very tightly, meaning you are very close to the action and you see very little of the background. Though these close up shots play out great, it would’ve been nice if the camera zoomed out a bit on occasion so that we could see the surroundings that these giants are fighting in. This may have also had to do with the fact that I did see it on an IMAX screen. I do plan on seeing it again on a normal screen to see if it looks better. I found the back story of one of the leads, Mako Mori (played by Rinko Kikuchi), to be the best of the bunch. In a very intense and emotional scene, the very young Mako, played by the wonderful Mana Ashida, is seen walking the streets alone during a kaiju attack. You assume that her parents were just killed and your heart just goes out to this child as the kaiju gets closer. You totally feel her pain and fear. She is saved by Stacker Pentecost (played by Idris Elba) in a Jaeger and he then raises her as his own child. The bond between these two are genuine and it is refreshing to see this kind of thing in a giant monster movie. I cannot recommend this movie enough as it has something for everyone; giant monsters, giant robots, lots of nonstop action, a great musical score, and in the words of the woman I went with, great eye candy for the girls! This is such a fun movie and really needs to be seen on the big screen. I really hope the makers of the 2014 release of the next Godzilla movie will take some cues from this film. If they do they will also have a great film on their hands! Now available on Blu Ray HERE! This entry was posted in Alien Invasion Films!, Movie Reviews, Science Fiction and tagged Burn Gorman, Charlie Day, Cloverfield, Creature Double Feature, Frankenstein Conquers The World, Godzilla, Guillermo del Toro, Idris Elba, IMAX, Jaegers, KAIJU, Pacific Rim, Rinko Kikuchi, Rodzn, Ron Perlman, War of the Gargantuas. Bookmark the permalink. ← New Svengoolie Burger enters the ring at Chicago’s “Squared Circle” Restaurant!